It feels like a natural progression for Target, but the addition of eight new beauty brands, most of which cater to a vast range of skin tones, is still an impressive addition. Starting today, the eight new brands (Coloured Raine, Everyhue, HALEYS Beauty, HUE NOIR, The Lip Bar, Makeup Geek, Reina Rebelde, and Violet Voss) will all be available online at Target.com and in stores on May 20th. After their expansive beauty offerings debuted last month, it seems that Target is ready to come out swinging for traditional beauty retailers like Sephora and Ulta. Most of these brands are either marketed directly to those with medium to deep skin tones, or feature an expansive and diverse shade range. The new launches include a large array of face makeup like foundation but brands like The Lip Bar have lipstick hues that pack a punch on any skin tone possible. It’s the opportunity for every single person that wants to wear makeup to shop at a makeup counter like anyone else would. A lot of these brands are also online-only shops, which means you’d be getting a chance to swatch in-store, something you otherwise wouldn’t get to do and would have to go through the age-old “what the hell is my shade” game online. 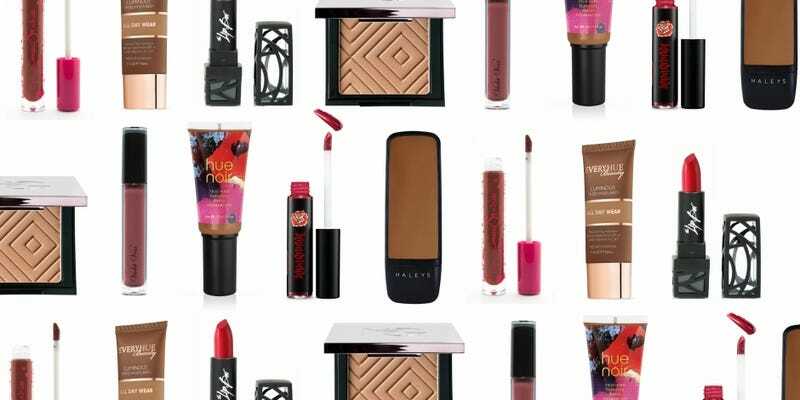 Standouts from the launches are the bold shades of lipsticks like Purple Raine from The Lip Bar, the gorgeous packaging from Reina Rebelde, the saturated colors from the cruelty-free brand Makeup Geek, and the 31 shade Re:Set matte foundation from HALEYS. And, coupled with the fact that these brands stay within the price point of Target’s other offerings, you’ll be able to afford a face full of makeup without feeling like you’re draining your bank account.